If you've used Folder Guard to lock a folder with a password, it's obvious how to unprotect such a folder: just double-click on the folder's icon, enter your password, and the folder would be unlocked. However, what if you have set up the folder to be hidden altogether? In such a case, when you browse your computer, you would not see the folder in the Explorer windows, and there would be no icon to double-click on! So, how to unlock the folder if it's invisible? 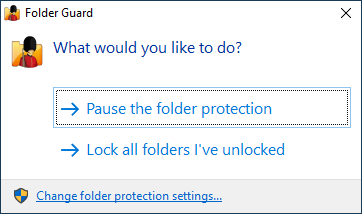 You can pause or resume the protection at any time by running Folder Guard using its Desktop shortcut or Windows Start menu. You may want to set up a hot key to give yourself quick access to the Pause/Resume Protection command by pressing a key combination of your choice. What is seven minus 5 ?